Unlike direct materials (which are obtained prior to being used) direct labor is obtained and used at the same time. This means that for any given good output, we can compute the direct labor rate variance, the direct labor efficiency variance, and the standard direct labor cost at the same time. 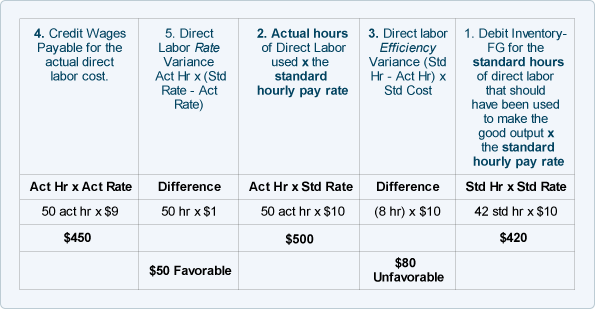 Later in Part 6 we will discuss what to do with the balances in the direct labor variance accounts under the heading "What To Do With Variance Amounts".